I’m so excited about this year’s gardening classes! We will be in some of the very best gardens in Greensboro. It will be a blast exploring them and learning from the successes and failures of the most knowledgeable gardeners around. Registration information is below and also at the bottom of the schedule. It’s time to create beautiful gardens together. That’s it! Your seat is reserved when your payment is received. I’ll be in touch soon regarding course materials and a reminder of where to meet. I can’t wait to see you in March! 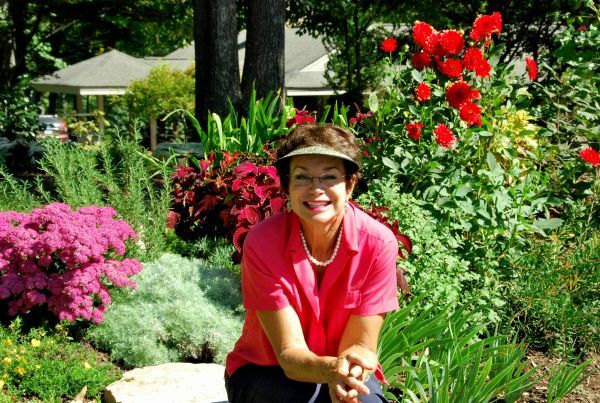 Ellen Ashley teaches an annual program of “hands-on” gardening classes, outdoors in beautiful gardens around Greensboro, NC. Contact her at ellen@learntogarden.net. Each class is 2-hours plus Q&A, at 2-4pm unless noted, most often on Thursdays & Sundays for each course. (Dates may be added if warranted by demand.) Approximately 15 students per class. Research-based course materials will be provided for each course. Classes will be offered as a complete program for $295 per student. Pruning guidelines & demonstration: (90 minutes) Bad pruning is the #1 mistake of homeowners and landscapers alike. Good pruning can transform your landscape into a thing of beauty. Improper pruning, including pruning at the wrong time, can destroy bloom buds, disfigure plants, invite disease, and do permanent damage to an otherwise healthy plant. Whether you do it yourself or hire it out, it is important to know what to do! I will have organic Deer & Rabbit repellent available for sale at this class. Soil Science and Why Organics Matter: Organic gardening is a process, not a product, and it all starts with the soil. You will learn the importance of soil, why pH matters, how to take a soil test, how to create new planting beds and rejuvenate existing ones, organic soil amendments, nutrient balance, and the role of microorganisms. You will receive Soil Test Kits from the NCSU Extension Service and instruction in how to use them. There will be an outside “show and tell” of the most cost-effective organic soil amendments, where to buy them and how to use them. Organic Vegetable Gardening: What to grow and When to plant. Edibles that make a beautiful addition to your flower border. Spring veggies, herbs and flowers including asparagus (a beautiful, edible perennial), potatoes, onions, lettuce, arugula, beets, peas, spinach, parsley, cilantro, dill, edible flowers and more. How to interpret your soil test reports. This will be a “hands-on” outdoor class held at the site of my brand new home, still under construction. It will be the perfect demonstration of how to deal with hard packed red clay, the problem that most intimidates would-be gardeners in the Triad. Easy-to-grow Fruits for your urban garden. How cool would it be to walk outside to snack on delicious ripe berries, kiwis, and figs right outside your back door? We will cover it all in this class. Learn about the best varieties of shrubs and trees that take you far beyond the 20 common plants you find in the average landscape. This Interactive outdoor walk will focus on how different trees & shrubs can be used to create a low-maintenance landscape with beauty and color. You will see how plants look at maturity (vs. in a nursery pot) so you understand their size and features. We will discuss individual plants and various cultivars available. Plants for screening and “evergreening” your property. Shade gardening is not for sissies! It means trying to grow things in a challenging environment. There are usually trees providing the shade so the ground is often root bound and dry as a bone. Then of course there is the lack of sun, an essential ingredient for photosynthesis! You will spend 2 hours in the amazing garden of Dr. Graham Ray, possibly the most gorgeous shade garden in the Triad! We will show you plants that thrive in this environment and discuss how to grow them successfully. You will receive plant lists for future reference. 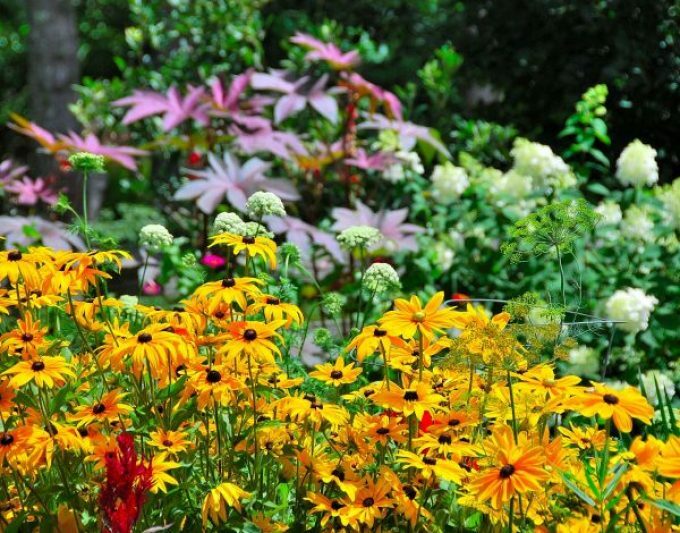 Annuals, perennials, biennials, bulbs and corms– what’s the difference? The most reliable summer bloomers and when to plant them. Spend your money wisely on deer proof, heat/cold tolerant, disease resistant, long blooming, and long-lived perennials. You may also want to know which ones are magnets for butterflies and hummingbirds. Many of these look bold and tropical, but are amazingly cold tolerant in the Triad. BONUS COURSE – Organic Lawn Care, taught by Tommy Cowett, “GrowinGreen” of Kernersville. Tommy Cowett will discuss the mind-blowing science of soil organics and why it matters for a beautiful lawn. (The garden’s lawns are organically maintained by “GrowinGreen”.) Spouses & significant others welcome provided that you reserve your space ahead. Tommy is an exciting speaker. Hold on to your seats! You will witness this amazing garden that Rachel originally started from tiny plant liners, passalong plants from fellow gardeners, and throw-aways from Walmort & Home Depot – living proof that gardening does not have to be an expensive habit. Garden Maintenance – This class will cover pruning and deadheading of spring and summer blooming shrubs and perennials, weed and disease control, bug identification and discussion of what to do about the bad guys & how to attract more good ones! 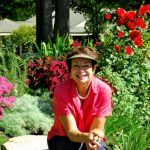 We will also discuss “preemptive pruning” of perennials to control size and help them hold up their heavy summer blooms. Experienced gardeners rarely walk into the garden without gloves and pruners in hand. 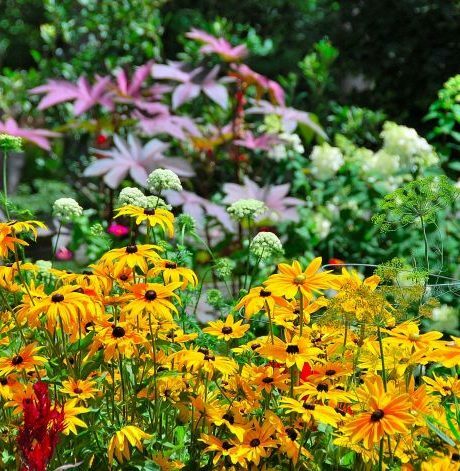 There are entire books written on caring for perennial gardens because plants are just different. You will learn how to rejuvenate your plants to keep your garden blooming beautifully through fall. Seed Saving – Late summer is time to collect seeds from spring bloomers to sow now or save for next year. Your garden is producing much more seed than you will find in 100 ordinary seed packets! I will show you how to collect seeds, dry them, and plant them for more blooms next year. Garden Design Principles. Fall is the perfect time to look around your garden with a critical eye. The ‘bones’ of your garden can be seen when the leaves have fallen and the perennials disappear for the winter. This is an interactive garden walk-about to examine WHY a garden scene is pleasing to the eye. Looking at specific components of the scene will uncover ideas that you can use in your own landscape design. Learn how to add excitement to your Fall & Winter Gardens. The Piedmont Triad is blessed with wonderful autumn leaf color. Make sure your garden has even more with fabulous Japanese maples, fall blooming camellias, asters, 6 foot tall ginger, helianthus, grasses, sedum and more. You will learn about keeping your winter garden beautiful with evergreens, berries, colorful bark, bulbs, stone and interesting textures. Little tasks to do in fall: Harvesting the last of your herbs before frost, planting garlic & spinach, what seeds to sow in fall for spring flowers, and what to do with leaves. Learn about frost protection to make the last of your fall vegetables hold weeks longer through the cold. All about the what, when and how much of “mulching”. That’s it! I can’t wait to see you in March!